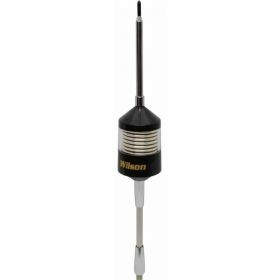 3,500 watt 26-30 MHz wide band center load trucker 10/11 meter antenna with weather trap, 10" stainless steel shaft & 49" rod. Coil in Black with Clear. Broadband design provides low SWR when operating on 10 meter and CB (11 meter) channels. The built-in weather trap increases reception of weather broadcasts.